Kristina is a caregiver to two children, a volunteer, writer, and always striving to learn different ways to lower her environmental impact. Something old, something new, something borrowed, something... green? 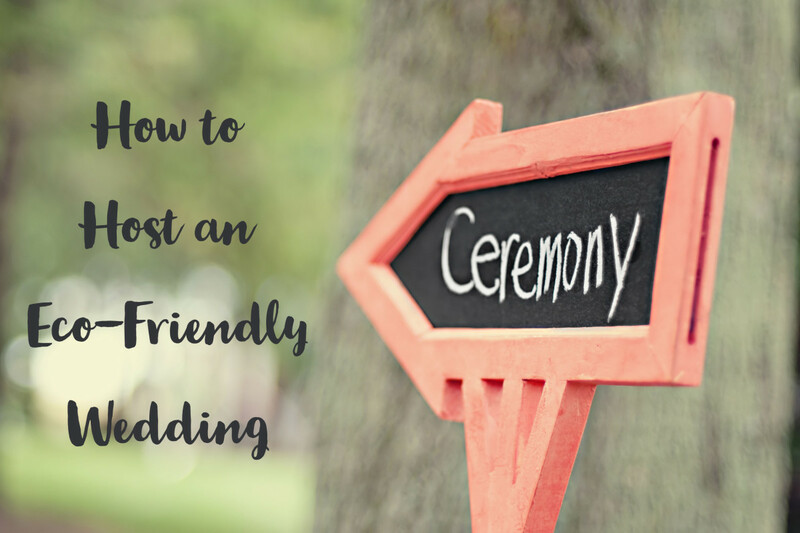 There are a million unique, fun, and festive ideas for planning a wedding (just scroll through Pinterest), but in this article, we're going to focus on different ways to make your special day more eco-friendly. The Chicago Tribune states that, according to "The Green Bride Guide," by Kate Harrison, a wedding produces roughly 400 lbs. of waste. Granted, a big event will generate waste and energy consumption no matter how hard we try, but taking steps and making appropriate, conscious decisions with the environment in mind will help bring down that number. More and more couples are considering the environment during their planning process, and making small, big (and better!) changes in order to lessen their impact and have a more sustainable event. Listed below are ideas and ways to host an eco-friendly wedding and reception. According to the Environmental Protection Agency, transportation is one of the primary sources of greenhouse gas emissions in the United States—"nearly 28.5 percent of 2016 greenhouse gas emissions." Choosing to have your wedding closer to where the majority of your guests live will greatly cut down on airplane and automobile travel. A destination wedding (as fun as it is) will create more emissions from burning fossil fuels than a wedding closer to home. It's one of the bigger environmental aspects to consider when deciding to host an eco-friendly event. If your event is out of town, encouraging your guests to carpool can help lower the event's footprint. Another great idea is to rent a van for groups. My brother and sister-in-law rented a 15-passenger van for a group to travel together to their wedding, which eliminated at least five cars from having to travel and purchase gas. Digital, digital, digital! Or at least some of it. We're in such an era of digital communication that it is simple to take advantage of technology to help spread the word about your wedding. And it will cut way back on the amount of paper that you would otherwise need. Consider sending your Save the Dates out via email. 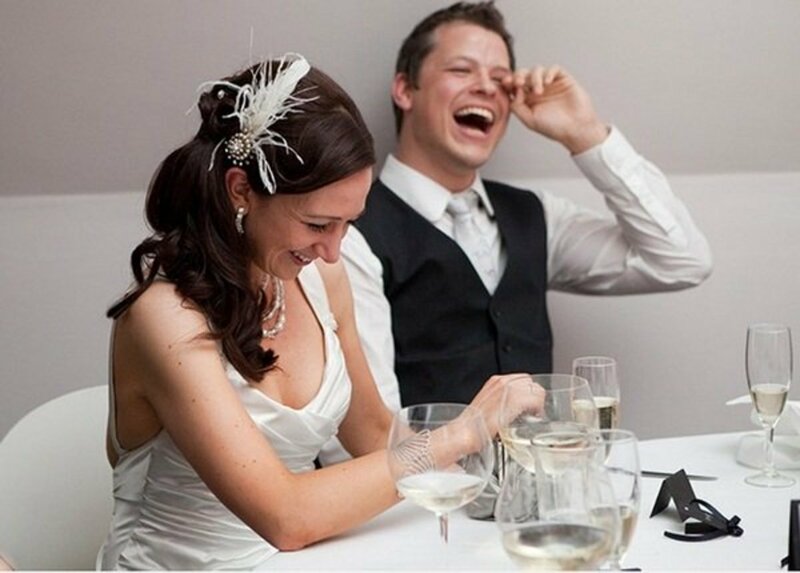 Create a fun wedding website, where guests can view pictures and read all about your wedding details. Give your guests the option to RSVP via email, phone, text, or through your wedding website. For your actual invitation, consider using recycled paper and envelopes. When designing your invitations, think about using primarily paper (instead of plastic, fabric, ribbon, etc) on your invitations so that guests can toss them into the recycle bin instead of the garbage can (unless they save them, that is!) My invitations were all standard, recyclable card stock with a little paper raffia. My brother and sister-in-law used chipboard, which is made from recycled fiber. They also ordered paper from the (fun fact) last remaining independent paper mill in the United States! You can find a ton of ideas online for eco-friendly decor. For my wedding, we chose a location that had natural beauty. It was at a state park on a gorgeous lake surrounded by trees, plants, and grasses. We held our ceremony under a shelter made of brick surrounded by a wooden fence. It already had natural beauty, so we didn't need a lot of decor to spruce up the place. We ended up with torrential rain all day (that's a story for another time! ), which dimmed the beauty of the location, but it's still a great option to consider for a green wedding. For table centerpieces, you can go the DIY route and create something beautiful using second-hand, upcycled, or recyclable materials. 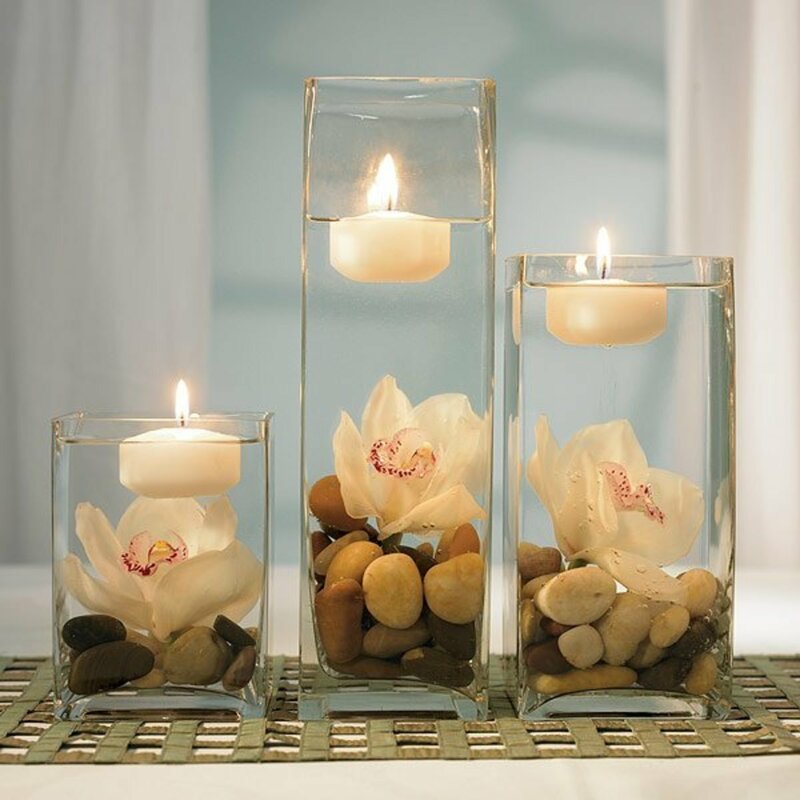 Vases, candle holders, baskets, boxes, and planters from thrift shops, empty wine bottles, mason jars, or tin cans—there are many different ways to reuse a container and turn it into a pretty centerpiece. We collected and borrowed coffee cans and tins, tied them with raffia, and filled with homemade coffee filter flowers (made of paper which can be recycled or composted). It was simple, subtle, and fit well with being outside at a state park. And they were fun to make! 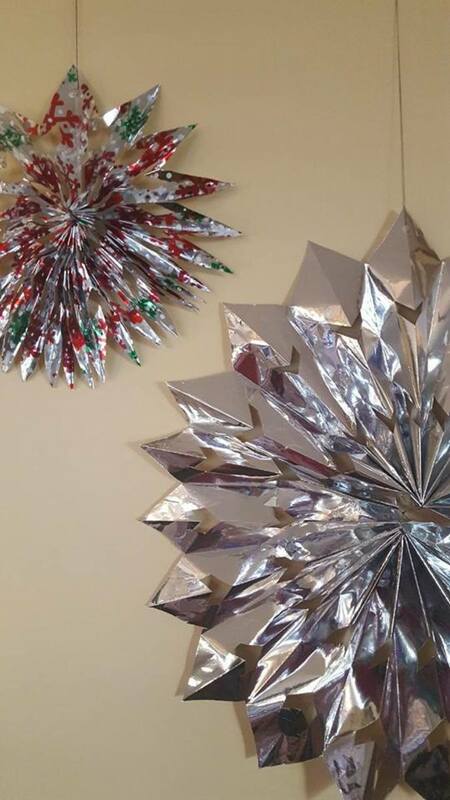 Or, you might be able to borrow or swap decorations. 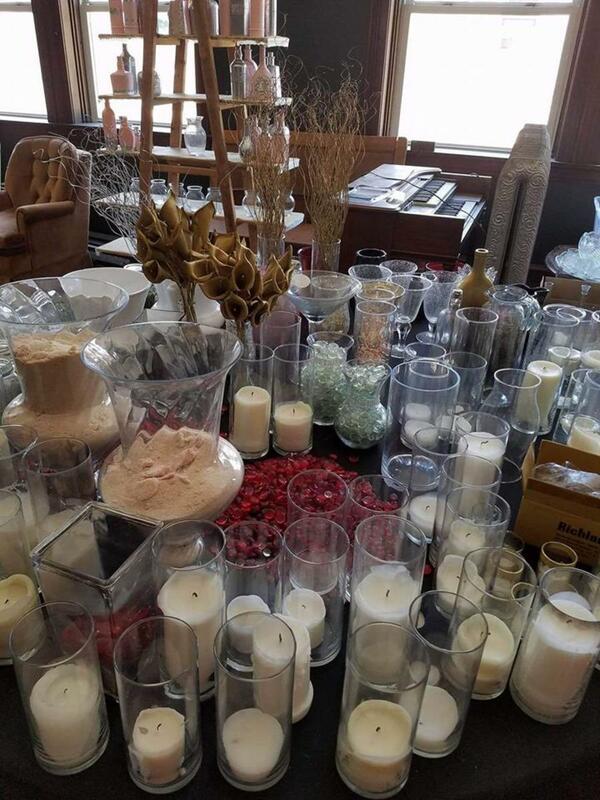 My brother and sister-in-law rented a venue that has a room full of decorations, centerpieces, frames, and other wedding items that previous parties have left behind. Anyone renting the space is welcome to use any of the items in the room and leave their own behind (if they wish) for the next party. This is an amazing way to reuse items, and not have to buy new! If your venue doesn't have this option, check Facebook Marketplace, Freecycle, "Buy or Sell" groups, or specific wedding Facebook groups in your area. Many people list their wedding decorations online after they are done using them. You could get already-made centerpieces and save yourself some time in the process! For anyone wearing a tux, it's always been a little easier to be "green," since tuxedos are easily rented and returned. Believe it or not; renting is actually starting to catch on for wedding dresses too! Currently, there are options to rent dresses for brides, bridesmaids, junior attendants, mothers, and even guests. Check out websites like Rent the Runway for online rental options. Don't forget to check your area for local rental companies that rent dresses. Since there still aren't tons of options for renting a dress, you may consider purchasing secondhand instead. Many wedding and bridesmaid dresses have only been worn once and are still in fabulous shape. A great way to actually try on the dress is to check out local consignment shops. In some areas there are consignment shops specifically for secondhand wedding attire. If you don't have any local shops, there are many reputable websites that allow people to list and sell their dress (either for a small fee, or a percentage of the sale). Check out Pre-Owned Wedding Dresses or stillwhite. You could find a beautiful dress for a smaller price tag! As for jewelry, some green options would be to borrow, rent, use family heirlooms, or purchase secondhand. For my wedding, I used a sparkling beaded necklace, bracelet, and earring set that had belonged to my grandmother. 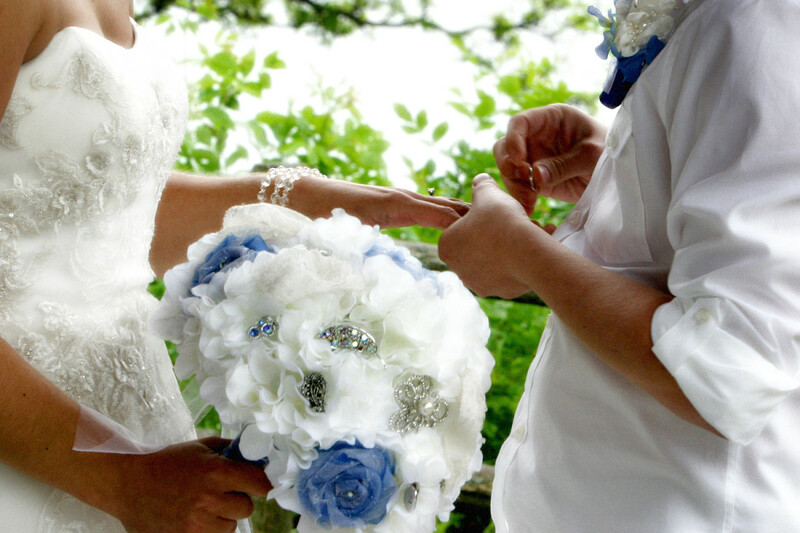 I absolutely loved that it was a family heirloom, and it went perfectly with my dress. 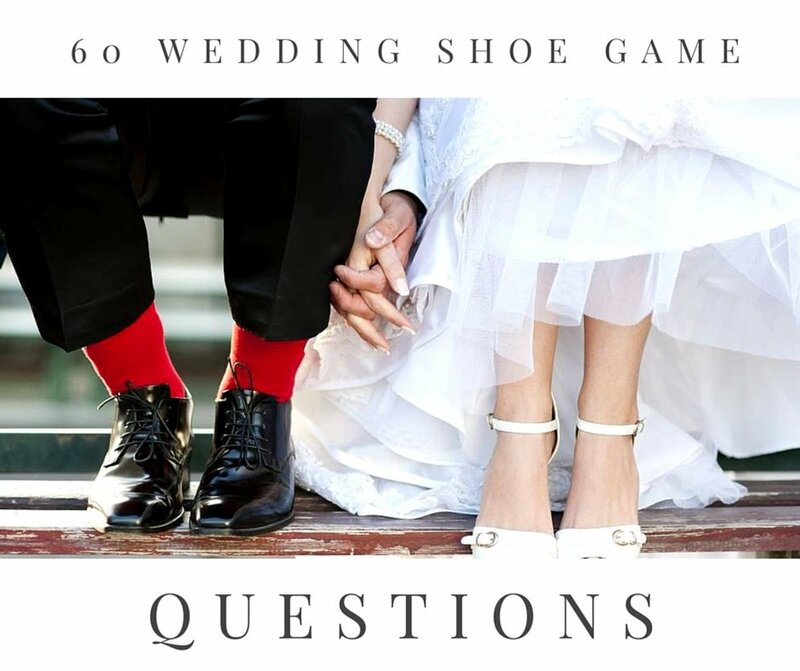 Considering all that, it's also understand that a wedding is a momentous event in life, and you may just fall in love with a certain dress and buy it new. If you buy new, I would highly recommend purchasing through a company that values sustainability, ethics, and fair business practices for their employees, the environment, and the people making the dress. If you're flexible with styles and colors, you could also consider giving your bridesmaids the option to purchase a dress secondhand. 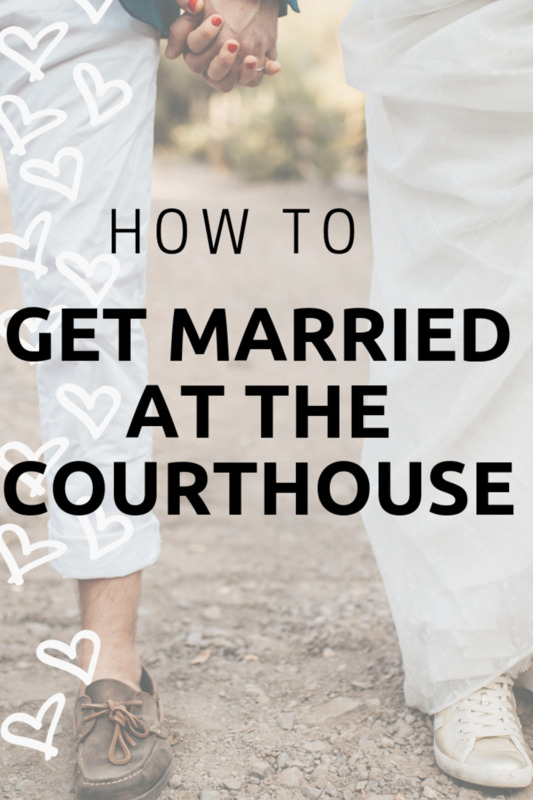 For my brother and sister-in-laws wedding, I purchased the exact dress secondhand that I would have purchased in-store, barely used shoes that I bought online, and secondhand jewelry that I found at a consignment store. There are a ton of like-new items for sale! Using disposable tableware can create a lot of waste from one single event. The best bet, if you have the option, is to use real plates, cups, and silverware. Yes, the dishes have to be cleaned afterward, but it still creates a smaller impact than one-time use tableware. Real tableware may not be an option for every wedding or every venue, especially if it's a large event. Because my wedding was outdoors and away from a real kitchen, we used compostable plates. Keep in mind that many brands are only compostable in an industrial compost facility. Some are also compostable at home (just be sure to check into that before you purchase). Unfortunately, I learned this after the fact, so my efforts didn't pan out in this case (it's also why I stress it to others wanting to use compostable material). If you have nowhere to compost the plates, recycled tableware is another option. One brand that I found in the grocery store is Chinet Classic White; plates made from 100% pre-consumer recycled material, and they are compostable. At your wedding, you would need to set a separate, labeled bin for the compostable tableware, so that no other trash gets mixed in. For food and beverages, try sourcing some of it close to home if possible. Perhaps the caterer has access to a garden where they source fresh vegetables. Or they make their own bread. Or, if you are serving alcohol, purchase it from a local brewery/winery. In order to minimize food waste after the event, ask your caterer if you can take any leftovers home, or if they can donate it to any food pantries or organizations that help feed others in the community. The caterer that I used for my wedding boxes up all leftover food and welcomes the happy couple to pick it up the following day. Another option would be to use a local nursery or flower farm that grows and cuts their own flowers. 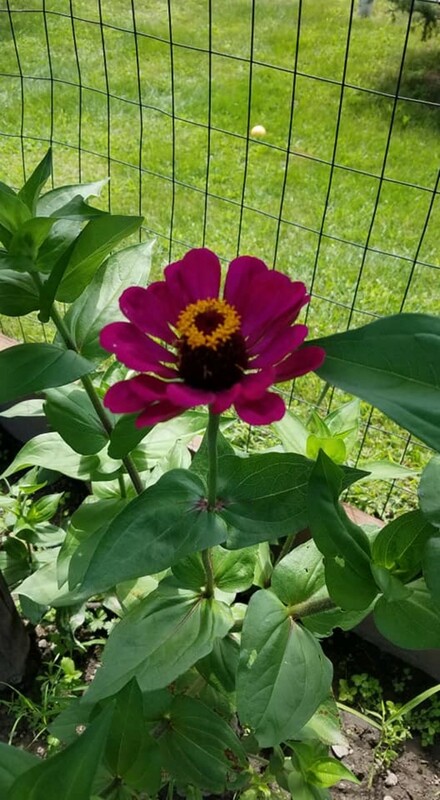 You may be able to find a flower farm that uses sustainable practices, doesn't use harmful chemicals, and grows flowers native to your area. My brother and sister in law used a local farm that grew the flowers, and then their venue donated any left behind to a nursing home where the residents got to enjoy them! If the flowers can be composted afterwards, even better! Lastly, you can DIY. Perhaps you can find secondhand silk flowers. 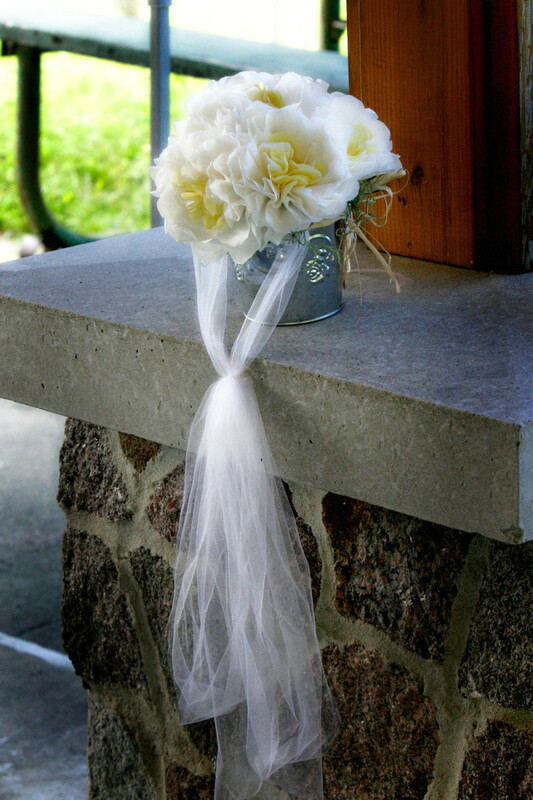 Or include elements into your bouquet that are eco-friendly. For my bouquet and the bridesmaids bouquets, I incorporated secondhand/antique brooches and pins. The brooches and pins added a sparkly effect without using new resources. My bouquet is now a decoration in my home, and won't get tossed into the landfill. Party favors are given to wedding guests as a memento of the special day. Small plants, herbs, baked goods, tea, cocoa, candy, mason jars for drinking cups, etc. Here's a cool idea: coasters made from tree limbs. A friend of mine had to cut down a small tree in her backyard, so they decided to use part of the tree and cut wooden discs for coasters from the branches. At my wedding, we created seed paper hearts from recycled paper, and gave out honey sticks from a local beekeeper. Many couples are also forgoing the party favor tradition, and instead donating to a charity in honor of the guests. For gifts, there are several things that could be suggested if you wish to cut down the amount of physical items (new resources) and waste generated (boxes, wrapping paper, ribbon). Many couples have created a honeymoon registry where you can purchase the happy couple an experience rather than a material gift. In other cases, couples are spotlighting the idea that guests are never required to bring gifts. For instance, writing "your presence is enough of a gift!" on the wedding website. My brother and sister in law decided to list charities on their wedding website that guests could donate to, in lieu of a gift. They also gave the option of purchasing carbon offsets as a gift, for any traveling that was required to get to the wedding (in honor of the bride and groom). Of course, receiving gifts is typically part of a wedding, so if you have a traditional registry, see if you can list products that are fairly made from a company that promotes sustainability! 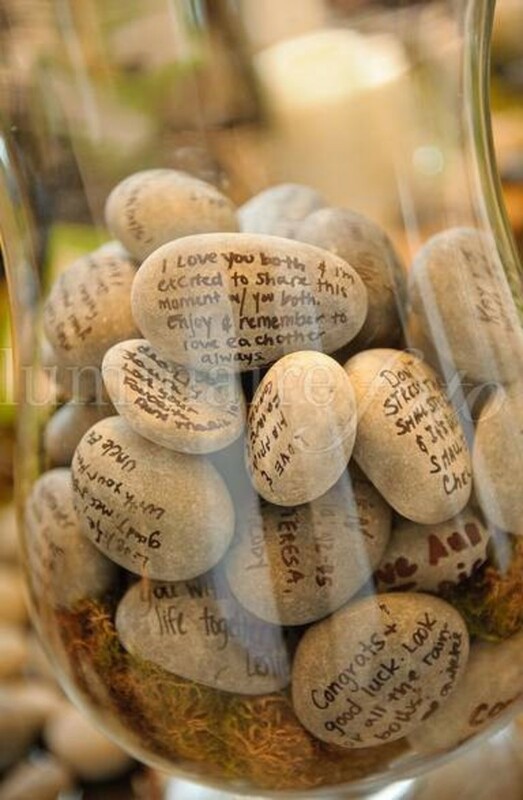 There are so many lovely ways to remember loved ones that have passed who can't be at the ceremony. For my wedding, my husband and I decided to have a tree planted for each family member that we were honoring. We donated to the Arbor Day Foundation, and in turn they plant registered trees in a specific forest and send you a certificate to print and keep. We framed the certificates (using frames from my bridal shower) and displayed them at the wedding. Another idea would be to purchase a beautiful secondhand or locally made candle to light in memory of them. Or have their favorite potted plants/flowers located at the wedding altar. Perhaps you could have a moment of silence, or play a special song. You could even designate a row of chairs or special seats during the ceremony and mark them with flowers or mementos from your loved one's lives. These are all low-impact but sentimental ways to remember those who were important to us! Do you have any other ideas for an eco-friendly wedding? 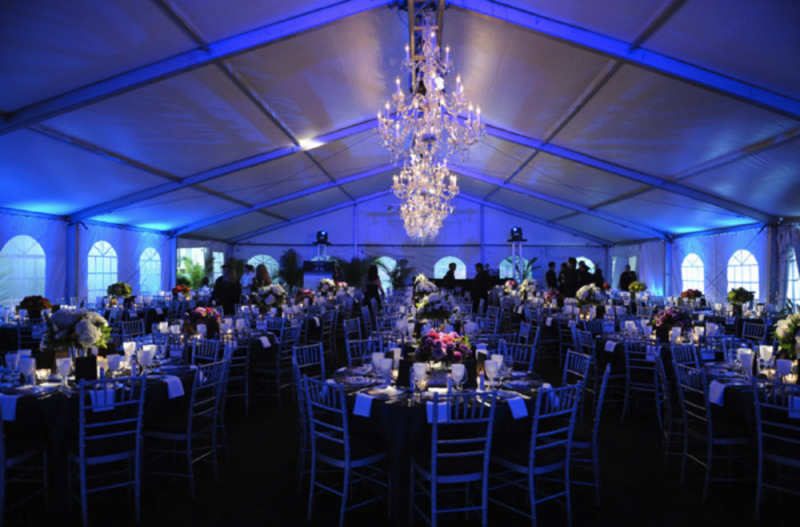 Did you plan your event with the environment in mind? I'd love to hear your ideas. Please share in the comments! And now that you have the "something green," don't forget the "something blue." Happy planning! Dora, thank you for your comment! It was so much fun to plan an eco-friendly wedding, and I'm so glad that you think it can help serve as a guide. Truly appreciated! Great wedding ideas for the eco-friendly. Your article might well become a guide for those desiring this kind of help. Thanks! Thank you very much Bre! I appreciate your comment! Wonderful ideas. The flowers are beautiful.